School Loop designed this feature primarily as a way for schools to separate news posted by the District site from the new posted by the school, but this element also allows webmasters and teachers to post the RSS feed from almost any source on their websites. The RSS Feed element and the ability for districts to post news to the school websites are features only available to those districts that purchased our Unification feature. 1. Obtain the URL For the feed you wish to display on your site. A simple way to obtain this URL is to right click (command + click for Macs) on the RSS icon (pictured to the right) and select the option to "Copy the Link Location". 2. Add the RSS Feed element to the page, then enter an optional title, the URL for the RSS feed of your choice, and the maximum number of headlines to display. Additionally, the RSS element can be locked down by the author by checking the "Only Author Can Delete" option. Doing so prevents others from deleting or moving the element. 1. Make sure to publish district news to the homepage only and not to any of the school sites. School news should be published using the News Element. 2. Click the RSS Feeds link in the footer of the district homepage. 3. On the next page, click the blue Homepage button and then copy the URL from the address bar of your browser. Alternately, you can use the right-click trick mentioned above on the Homepage button. 4. Add the RSS Feed element to the school homepage, then enter an optional title (for example:. "District News"), paste the RSS feed URL for the district that you copied in step 3, and the maximum number of headlines to display. There's no need to restrict yourself to using this element for RSS feeds from your own sites. The Internet offers a plethora of feeds from educationally relevant sites, such as the US Department of Education (pictured on the right), local news and weather reports. 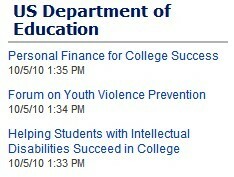 The URL for the US Department of Education feed is: http://www.ed.gov/feed.